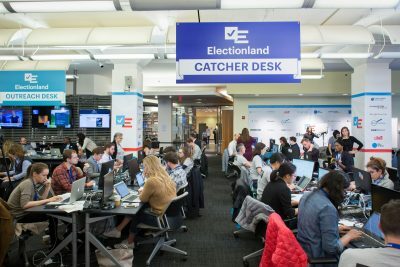 In the run-up to the 2016 election, ProPublica organized a project called Electionland to cover voting, nationally and in real time. Along with a coalition of news organizations and tech companies, we brought together more than 1,100 journalists around the country to cover impediments like restrictive voting laws, allegations of voter fraud, voter harassment, equipment failures and long lines — all of which can effectively disenfranchise eligible voters and erode the integrity of the vote. Today we’re announcing that we’re relaunching Electionland to cover the 2018 midterm elections. Policies and practices that jeopardize Americans’ fundamental right to vote demand scrutiny. And the concerns raised by the 2016 election — about cybersecurity and foreign attempts to sow doubt about the integrity of the election — make this even more urgent. We’re recruiting newsrooms interested in collaborating with us to cover these issues. Thanks to our coverage in 2016, New York restored access to its elections hotline during early voting, a Texas poll worker misinterpreting the state’s voter ID law was set straight, and two women denied the ability to vote were able to cast their ballots. If you’re interested in joining Electionland 2018, find out more and how to sign up. At least six bills have been proposed this year that would make it harder to vote. Almost immediately after the presidential election, accusations of hacking, foreign interference and voter fraud began to make headlines. To investigate unsupported claims of mass illegal voting, President Donald Trump set up a Commission on Election Integrity and appointed allies to it who seemed to have had a predetermined outcome in mind. It was shut down after a series of controversies. Supreme Court cases that will have a major effect on future elections are expected to conclude in a few months. The electorate is polarized as perhaps never before. There are more questions than answers about the role played by alleged Russian hackers in influencing the 2016 election. The Department of Homeland Security said the election systems of up to 21 states were targeted in the run up to Election Day. The Senate Intelligence Committee concurred with those findings in a report released this week. But as the midterms approach, we have only an incomplete understanding of what happened. Even with full information, it’s not clear whether states and counties have the capacity to defend their elections systems against cyber threats. The omnibus spending bill passed last month allotted $380 million to pay for new equipment, but the funding distribution is determined by population, not need, and few state or county elections offices have a security staff that is a match for state-sponsored hackers. It would be hard for any single newsroom to cover this alone. Election administration is both a local story and a national one. The Congress defers to the states on almost all matters related to running elections, which means that there isn’t just a single “Election Day” in the U.S., there are, in a sense, thousands. Each jurisdiction has its own rules and systems and problems. That’s why we’re relaunching Electionland. The 2018 version will bring together reliable data about voting in America to power our own reporting as well as reporting in newsrooms around the country. Participating reporters will get the information, context and contacts they need to cover voters’ concerns about disenfranchisement, fraud, interference and hacking, both in the run up to the election and on Election Day, when they will receive alerts about voting problems in their area. We’ll build upon the tools we built for Electionland 2016 and empower local reporters with information early enough to take action while voting is still happening. Our goal, as it was in 2016, is to cover the voting problems that matter most and — most importantly — to do so fast enough that they can be fixed in time for eligible voters to vote. If you’re a journalist and interested in working with us, fill out our form and somebody will be in contact soon.